Prompted by their new alliance on Nederland 3 (one of the three Dutch public TV channels) the VARA, VPRO, NPS and RVU broadcasting stations decided to replace their old premises scattered all over Hilversum with a concentration of new-build in the Media Park. The most high-profile project is MVRDV's building for the VPRO, whose culture-based image led them to engage young adventurous architects for the design. The 'villa-ness' of the old accommodation in freestanding houses resonates in the new-build through the open flowing space and an 'office landscape' design featuring conservatory doors and a profusion of patios drawing daylight deep into the block. Workplaces are identified by semi-transparent partitions, cupboard units and rugs. Villa VPRO has a 'free section' as well as a free plan, in that the floors fold and kink when viewed in section. In the facades it is only the thickness of the floors that is articulated; the transparent planes between floors consist largely of sliding glass panels held in hardwood frames. The floors themselves, which contain all the services, are borne aloft by a network of cylindrical columns on a square grid. Another MVRDV creation realized at virtually the same time was the RVU's building, an elongated Corten steel clad volume half tucked into a hill. Invisible from the street, it thrusts into space towards the VPRO building. A public route leads from the sedum roof down a stair to the entrance in the centre of the block, from where it continues on down to the jutting portion of the building. 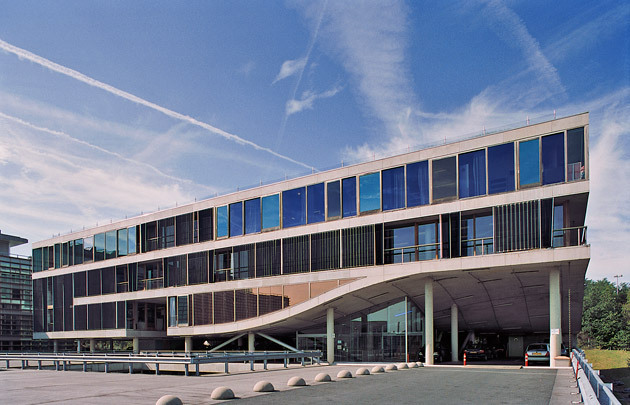 The offices of the combined VARA and NPS, designed by P.J. Boerstra and F.J. Hoekstra of Royal Haskoning, occupy a rectangular volume clad in wooden slats whose interior alternates offices and studios with large open areas. Between the VARA and VPRO premises is an intervening building that pulls the various components together.